A high-quality digital audio recorder is a must in the worlds of art, music, and entertainment. There are numerous uses and each one of them equally important and demanding. And that is why it is crucial to choose a recorder that can not only handle its demands but also is durable, functional, and efficient. But with a competitive market that is filled with different brands and models, how do you make the right decision? The entire process can be unbelievably daunting and time-consuming. To save you from such stressful experience, we have decided to compare and review two of the most popular digital audio recorders in the market. Zoom ZH1 and Tascam DR-05 are well-known among the recording community for their prowess and efficiency. Well, we are here to check those claims so that you can make the right decision. 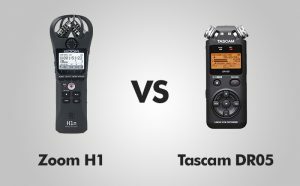 So, here is an in-depth comparison and review to decide which one is the best- Zoom ZH1 or Tascam DR-05. The first thing that needs to be evaluated is their quality and design. Both Zoom H1 and Tascam DR-05 are very differently built and have significant differences in their quality. Tascam offers much better quality and a sturdiness that is lacking in H1. Just by holding the DR-05 in your hands, you will be able to tell that it is durable, strong, and of extremely high-quality. While the H1 is of decent quality, it stands nowhere near the DR-05. H1 feels rather finicky and breakable and you definitely do not want to drop your H1. Apart from the superior build quality, DR-05 also shows a better understanding of its design. There are more buttons and functions that can help you do exactly what you want in a matter of seconds. You can easily pause your recording and restart it from the very same point without any difficulty. You also get an external mic, an instrument tuner, and the ability to edit your audio, all of which are missing in H1. When it comes to the design of H1, everything is rather simple and uncomplicated. You only get one button in the front that handles the power on and off. The other functions are conveniently placed in the side which can be quite helpful but you only get a couple extra functions, which is disappointing. Both the recorders have a headphone jack for accurate monitoring and stores the audio file in a microSD card. Although DR-05 do offer a 3gb MicroSD card as opposed to the 1 GB one that H1 avails. While the DR-05 offers more functions and buttons, it can also get complex if you just want to record without any hassles of complicated controls. In such cases, the simplicity of the H1 will be beneficial for you. If you are an amateur just wanting to record some audio, which any complicated functioning, then H1 is the right choice. The DR-05 is also bigger and bulkier than the H1. It also adds some extra weight which can be an issue for some people. But we definitely cannot ignore its superior quality and durable design. When it comes to the audio quality of both the recorders, we found both of them quite good. Whether you want to record an interview, a concert, or a simple music, both the recorders show a great capability to provide high-quality audio. The sound is clear, accurate, and definitely worth the money you are paying for them. Zoom H1 has a clean and clear audio quality without any deformities and glitches. You can easily connect the recorder to your computer and edit the audio if needed. While it does provide high-quality audio, it disappoints in its features and functionalities. You do not get to do much apart from recording the audio. Tascam DR-05 offers numerous superior audio functionalities that the H1 has missed on. DR-05 allows you to go back and edit your audio including changing the audio file’s playback speed. It can be quite beneficial if you are using the recorder for transcription and do not want to spend several hours listening to the long audio. We also loved the fact that despite changing the speed of the recorded file, there were no disruptions in the pitch. The quality stayed the same and the authenticity of the recording was protected. Another remarkable feature that DR-05 offers is its ability to level align. You can level out any uneven volumes and adjust it to focus on a particular sound. It can be especially helpful in press conferences and corporate meetings. H1 is good for simple recording but if you want any of these superior features, you will be terribly disappointed. PROS: Simple and uncomplicated design / Easy to use / Good audio quality / Extremely cheap. PROS: High-quality material / Durable and sturdy / Offers numerous editing features / Offers 2 GB microSD card / Allows to edit & control volume and speed. If you are looking for a high-quality digital audio recorder that is affordable and effective, both Zoom H1 and Tascam DR-05 will not disappoint you. While Zoon H1 is cheaper than DR-05, the difference is not that significant. Your decision solely depends on your needs and requirements. If you are an amateur and looking for a simple and effective recorder to start, Zoom H1 is your best choice. The simple design and the uncomplicated functionality will suit your needs just fine. But if you are a professional wanting to record music or transcribe interviews, Tascam DR-05 will suit you better. Its capability to edit and adjust the volume and the speed of the recorded audio makes it much easier to work with. You also get numerous editing options which will be helpful in a professional setting. Choose the best recorder according to your needs and make the right decision.